Previously published in the MARE Report (2015). There is no doubt that Roald Kverndal (1921-2015) made an enormous contribution to seafarers’ welfare as a chaplain, a mission board executive, historian, theologian, author and advocate. His service to seafarers and those who serve them extended from the beginning of his preparations for ministry in the early 1950s till the end of his life. In his early career Kverndal studied maritime law and seemed destined for a career in the shipping field, but a strong sense of calling to ministry, specifically ministry among seafarers, was to mark the latter two thirds of his life. It was his effort to apply his intellect to the study of maritime mission that revolutionized the field, applying the insights gained from research to further the work of faith-based seafarers’ welfare. Kverndal was deeply interested in the history of maritime mission but he never lost sight of issues facing seafarers in the contemporary world; neither did he neglect the challenges that confront those involved in maritime ministry. He was truly a pioneer researcher, breaking new ground when he began work on the history of maritime mission and eventually earning a doctorate in theology at the University of Oslo in 1984. This in turn gave rise to the publication of his landmark work Seamen’s Missions: Their Origin and Early Growth in 1986. Most people in their sixties would be content to rest on their laurels at that stage but Kverndal was, as ever, a man on a mission. By the end of the 1980s he was moving toward founding an institution to study questions pertinent to seafaring. In 1990, Kverndal helped found the International Association for the Study of Maritime Mission. From 1979 to 1990, Kverndal was Executive Secretary of the then-International Council of Seamen’s Agencies (ICOSA); by the end of his tenure, ICOSA was well on its way to becoming NAMMA. Issues of the journal Watermarks from those years show how deeply committed and how involved Kverndal was in interpreting and responding to the massive changes and challenges that were facing the shipping industry, seafarers, and maritime ministry. He served as a consultant on maritime ministry to the Lutheran World Federation as well as his work for ICOSA in the 1980s and into the 1990s. Not even retirement could stop his determined efforts on behalf of seafarers. 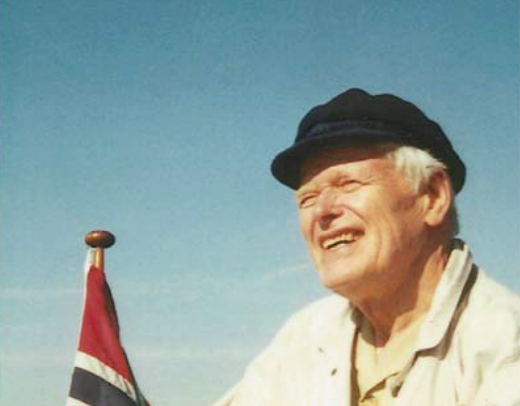 Kverndal responded to the issues facing maritime ministry in the new millennium with the publication of his second major study, The Way of the Sea, which was published in 2008 when he was a sprightly eighty-seven year old. Yet there was another book left in Kverndal, a slimmer but still significant contribution: a biography of his ‘hero’ of maritime mission, George Charles Smith of Penzance, published in 2012. Roald Kverndal was instrumental in putting the study of maritime mission into the wider canon of mission studies. His research has informed and inspired those who seek the spiritual, physical, and emotional welfare of those who go down to the sea in ships. The Very Rev. Dr. Paul Mooney, Dean of Ferns, received his doctorate for a thesis on maritime ministry from the Faculty of Protestant Theology in Brussels, Belgium and has served as port chaplain in Korea, Belgium and Ireland.